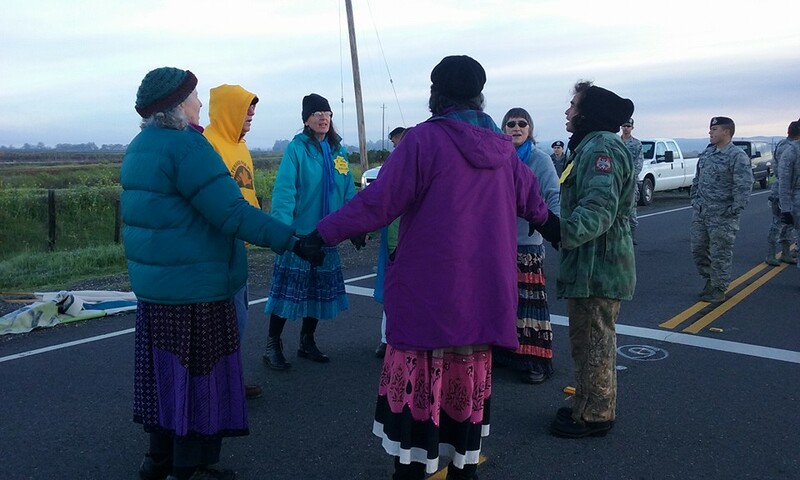 Seven of the 11 activists who gathered at the Wheatland gate of Beale Air Force Base, California around 6:00 a.m. this morning were arrested for protesting the Global Hawk drone mission of the base. At 7:15 a.m. the group was handcuffed and taken inside the base for processing, where we were each cited for trespassing on a federal installation and released about 90 minutes later. 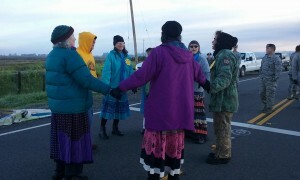 Just prior to being arrested, the seven of us blocked a long line of morning incoming traffic for about 20 minutes before crossing over the white line onto base property. Just before stepping over the white line, our group spread out and held hands directly facing the large squad of military police who stiffly stood at the ready holding plastic handcuffs. One of the women in our group spoke to the MP’s telling them that we were working for peace so that they too would have a safe and peaceful future. After she finished I told the solemn looking MP’s to keep open hearts during their time in the military. I then went on to share with them my own story of having lived on Beale Air Force Base from 1969-71 where my dad was stationed. I told them how I joined the Air Force myself in 1971 after having graduated from nearby Wheatland High School in 1970. I shared my experience being stationed at Travis Air Force Base (about 80 miles south of Beale) that was an airlift base for the war in Vietnam. It was there, I said, that the anti-war protests outside and inside the base transformed me from a hard-line right-winger into the peace activist that I am today. The protest actually began yesterday at Beale when at 3:00 p.m. about a dozen activists from several northern California communities held vigil at two base gates for two-hours as military personnel were released from work. Three of us were at the Doolittle gate where we stood with banners as several U-2 spy planes practiced “touch and go” landings just over our heads. From where we stood we could clearly see the PAVE PAWS early-warning radar facility (recently upgraded for participation in the Pentagon’s “missile defense” program). Regular monthly protests have been happening at Beale for the past five years. Over 130 people have been arrested for nonviolent civil resistance at the base during that time. Following Monday’s afternoon protest the dozen of us gathered in a clearing near the Beale main gate where we held a potluck supper by firelight. I was asked to speak about the work of the Global Network and Beale’s role in connection to space warfare technology. I was also asked to share what I know about the U.S.’s Ramstein Air Force Base in Germany that is the global operation center for the Pentagon’s drone warfare program that has killed thousands of innocent people. All drone surveillance and targeting is run through Ramstein using military satellites and fiber optic cables to relay data from drones flying over the Middle East and Africa to the drone pilots sitting at consoles back in the U.S. Fearing that growing resistance to German complicity with the U.S. drone killing program will force the closure of the Ramstein operation, the U.S. has recently created a back-up drone operations center in Sigonella, Sicily. As my hosts Toby and Fred from the San Francisco Bay Area were driving us back to their home in El Cerrito, they kindly stopped in Wheatland so that I could take a brief walk through the grounds of my old high school. Surprisingly the school had not changed much at all during these many years since I had graduated. It was quite an emotional moment for me to walk by my old classrooms, the gym where I left much sweat on the floor playing basketball, the baseball field, the cafeteria, and the football field where I remember running 100-yard wind sprints with full gear on. I have been following the determined protests at Beale during the past five years and had hoped to be able to participate with them at some point. It was a great thrill and honor to join hands this morning with these dedicated peace workers. I will always cherish these last two days at Beale. Keep going, dear friends.